This page is to help all Windows users resize Western Digital (WD) hard disk partition with professional partition magic named IM-Magic Partition Resizer. Download IM-Magic Partition Resizer Server to extend or shrink Western Digital disk partition including system partition and data partition for Windows PC. You can download the IM-Magic Partition Resizer which works as partition magic to extend a system partition when it is running on low disk space, or extend a data partition when it is nearly full. You can also rely on the IM-Magic Partition Resizer to shrink a disk partition when it still has a lot of free disk space while some other partition is running out of disk space. IM-Magic Partition Resizer has two editions, with which you are able to resize Western Digital hard disk on all Windows OS including Windows Vista/XP/7/8, Windows Server 2000/2003/2008, and Windows SBS. Download IM-Magic Partition Resizer Free for Windows 8/7/Vista/XP/2000. Download, install and launch IM-Magic Partition Resizer on your computer, and then all partitions will be shown on the software. You may right click the partition that has the most free disk space and choose "Resize/Move" option. Move the arrow either from left to right or right to left, and then you can see free disk space. The free disk space will be shown as an unallocated volume. Move the unallocated volume close to the partition you want to extend. 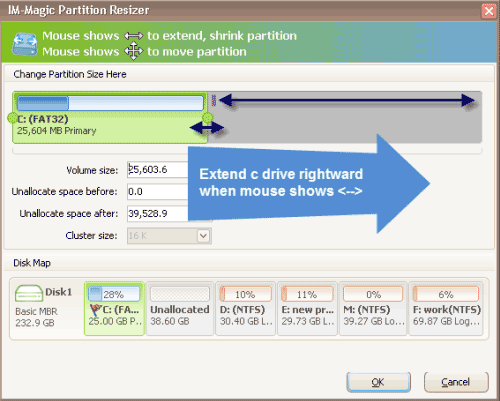 Then right click the partition you need to extend and choose "Resize/Move" option. Nowadays, more and more people like to write data on a computer instead of writing on paper. For instance, some people like to keep a diary to record their daily life on a compute rather than writing them on a notebook. Some people may need to store different types of files like pictures, excel files, word files, videos, etc on a computer due to the requirement of their work. As know to all, all data stored on a computer is truly stored on a hard disk. Western Digital hard disk, as one of the most famous brand of disk, has been widely used by many computer users. Since you may store many files to the Western Digital hard disk every day, it is obvious that the original disk space can no longer meet you needs to save more data sooner or later. When the free disk space of a partition is not enough, things might become difficult sometimes. The most troublesome thing is that the system partition is running out of disk space on computer, because a system partition is closely related to the performance of a computer. In order to avoid unexpected trouble or data loss, Windows system often prevents you from formatting a system partition or deleting some files from the partition. Therefore, it is difficult to free disk space on a system partition by formatting the partition or deleting files. When you buy a new computer, the professional computer worker may only help you partition the hard disk into four to five sections without thinking how much disk space should be allocated to each section. Thus, you may find that some sections have lots of free disk space, while some of them are quite small. Along with more and more data is stored to the partition every day, the partition with small size may become full soon. It is true that you can move or delete some files from the partition to free disk space, but it is not an effective way to resolve the problem once and for all. 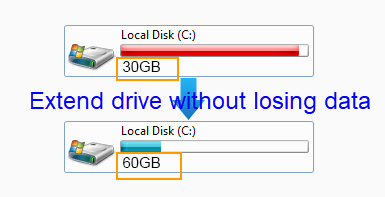 As a computer user, you may encounter low disk space problem more or less. IM-Magic Partition Resizer is able to help solve low disk space problem on your computer disk partition by extending the disk partition. This partition magic can help extend a system partition or data partition when it runs on low disk space. No rebooting is required, and you can easily extend the partition you choose with a few mouse clicks. NTFS file system partition and FAT32 file system partition is supported by IM-Magic Partition Resizer. IM-Magic Partition Resizer has two editions. You may select the proper one for disk partition resizing on all Windows computers including Windows XP, Windows Vista, Windows 7, Windows 8, Windows Server 2000, Windows Server 2003, Windows Server 2008, Windows Server 2003 R2, Windows Server 2008 R2, SBS 2003, and SBS 2008. It is completely safe for both system and disk data to install and use IM-Magic Partition Resizer to resize any disk partition on your computer.